New Tobacco Infographic from Healthy People 2020. Office of Disease Prevention and Health Promotion. (Mar 2019). New Smokefree Movies Ad. Smokefree Movies. (Sept 5, 2018). Implementing Tobacco-Free Pharmacies: An Infographic of Talking Points and Policy Strategies. ​ChangeLab Solutions. (August 2018). Cigarrillos electrónicos, ¿cuál es la conclusión? Centers for Disease Control and Prevention. (June 2018). Secondhand Smoke Fact Sheet and Infographic. Truth Initiative. (April 2018). Teachers and Parents: That USB Stick Might be an E-Cigarette. Centers for Disease Control and Prevention. (April 2018). Electronic Cigarettes—What’s the bottom line? Centers for Disease Control and Prevention. (March 2018). 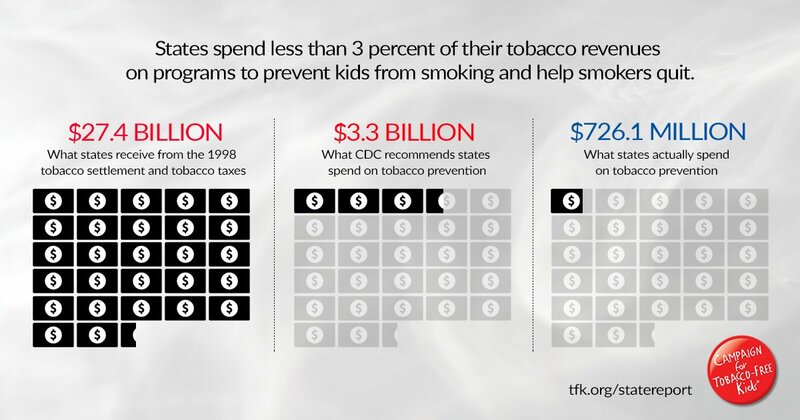 State Spending on Tobacco Prevention. Campaign for Tobacco-Free Kids. (December 2017). Youth Tobacco Use: Results from 2016 National Youth Tobacco Survey. FDA Center for Tobacco Products. (October 2017). Tobacco Use Is Not An Equal Opportunity Killer. Truth Initiative. (February 2017). 8 maneras que el uso de tabaco afecta a personas vulnerables. LGBT HealthLink. (November 2016). 8 Ways Tobacco Affects Vulnerable People. LGBT HealthLink. (November 2016). ​El consumo de tabaco y la exposición al humo de segunda mano son altos en las viviendas de múltiples unidades. Centers for Disease Control and Prevention. (July 2016). Tobacco Use and Secondhand Smoke Exposure is High in Multiunit Housing. Centers for Disease Control and Prevention. (July 2016). World No Tobacco Day. Centers for Disease Control and Prevention. (May 2016). Tobacco Use Among Middle and High School Students - United States, 2011-2015. Centers for Disease Control and Prevention. (April 2016). The Common Sense Census: Media Use By Tweens + Teens. Common Sense Media. (November 2015). Smoking and Tobacco Use Infographics Gallery. Center for Disease Control and Prevention. (2014). ¡A la Buena Salud! – To Good Health! Center for Disease Control and Prevention. (2015). Women and Smoking. Center for Disease Control and Prevention. (2014). Smoking and Diabetes. Center for Disease Control and Prevention. (2014). When Smoking Affects Your Family, It's Personal. Center for Disease Control and Prevention. (2014). When Smoking Affects Your Family, It's Personal- Ann Staples. Center for Disease Control and Prevention. (2014). When Smoking Affects Your Family, It's Personal- SG Regina Benjamin. Center for Disease Control and Prevention. (2014). Tobacco: The True Cost of Smoking. American Cancer Society. (2012). Are You Giving Yourself the Best Chance to Quit? National Latino Council on Alcohol and Tobacco Prevention. (2014). The Changing Landscape of Youth Tobacco Use. Federal Drug Administration. (2014). Smoking and Pregnancy. Center for Disease Control and Prevention. (2014). Business or Exploitation? truth. (Feb 2017). World No Tobacco Day 2016 - Get ready for plain packaging. World Health Organization. (May 2016). The Next 50 years. Centers for Disease Control and Prevention. (July 2015). Tips from Former Smokers Videos. Cen﻿ters for Disease Control and Prevention. (January 2015). Robbing the Future. Centers for Disease Control and Prevention. (November 2014). Unequal Opportunity Killer. Centers for Disease Control and Prevention. (2014). 5.6 Million Children. CDC. (January 2014). Legacy Latino Health College Initiative. Legacy. (September 2014). Spanish version. Do Not Smoke: beware of the chemicals your body absorbs. National Alliance for Hispanic Health. (2013). Deje de Fumar ("Quit Smoking"): Part Uno. National Alliance for Hispanic Health. (2012). Deje de Fumar ("Quit Smoking"): Part Dos. National Alliance for Hispanic Health. (2012). Any Volunteers? The Risks of E-Cigarettes for Young People. Office of the Surgeon General. (Apr 2017). Rhett & Link Meet the Surgeon General. (Apr 2017). LEFT SWIPE DAT Official Music Video. truth. (Feb 2014). ​The Real Cost. US Food & Drug Administration. (Oct 2014). ​Listen to the Tobacco Control Network (TCN) first podcast of the 2018 Podcast Series: “Collaborating with National Networks to Promote Health Equity Through Tobacco Control.” On this podcast ASTHO, Nuestras Voces, Geographic Health Equity Alliance, and the National Native Network describe the work that CDC-funded national networks are doing to address tobacco disparities, and provide insights on how state health departments can partner with these networks.